Yashodhara or Yasodhara (यशोधरा) means renowned, one who has achieved fame. Masculine form of Yashodhara is Yashodhar (यशोधर). In Hindu epic Mahabharata, Yashodhara was daughter of Krishna and Rukmini. 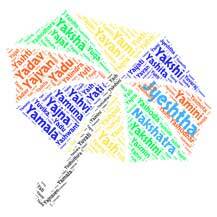 Also Yashodhara was name of a princess of Trigart wife of king Hasti and mother of Vikunthan. Princess Yasodhara was the wife of Prince Siddhartha Gautama, the founder of Buddhism. In Hindu epic Mahabharata, Yasodhara the princess of Trigarta was eife of Hasti who founded city Hastinapura. Yashodhara Raje Scindia : Yashodhara Raje Scindia of Gwalior is the youngest daughter of the Late Jivajirao Scindia, Maharaja of Gwalior, and the Late Rajmata Vijayaraje Scindia of Gwalior. Yashodhara Ray Chaudhuri is a poet residing in Kolkata, West Bengal, India, and an established name in Bengali poetry. Harshvardhan is an ancient word of Sanskrit origin, which me..
Sanskrit name Lalana (ललना) is a girl child's name which lit..